Ship inside a Bottle sets you free on a voyage that you always want to take. 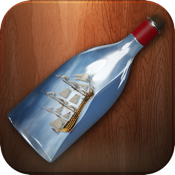 Simply open the app, tap the waves and position your device to enjoy your own ship in a bottle. Through calm waters and rough seas, you set the tone for the journey or let the device auto-run in the background. Choose from several different ships and floating objects and experience the beauty of the ocean today.